Around 300,000 young at foot and 800,000 pouch young killed or left to die each year as a result of the commercial industry. This equates to 11,000,000 joeys over 10 years. In many places, killing of young wildlife is considered an unacceptable practice, as evidenced by the banning of the products from Canadian Harp Seals in many countries, including the US, Mexico, Russia and the EU. 1. Voiceless: the animal protection institute, Kangaroos < http://www.voiceless.org.au/The_Issues/Fact_Sheets/kangaroos.html> accessed 7 October 2010. 5. See, e.g., the material referred to in RSPCA Australia, The Kangaroo Code Compliance Report: A survey of the extent of compliance with the requirements of the Code of Practice for the Humane Shooting of Kangaroos, prepared for Environment Australia, July 2002 <http://www.deh.gov.au/biodiversity/trade-use/publications/kangaroo-report/summary.html#71> accessed 8 October 2010 at 5.2.1. 6. American Veterinary Medical Association, 'Report of the AVMA Panel on Euthanasia' (2001) 218 Journal of the AVMA 669, 681. 7. NSW Young Lawyers Animal Rights Committee, 'A submission to the NRMMC Working Group on the National Code of Practice for the Humane Shooting of Kangaroos' (prepared by Kristen Dorman, Carolyn Wilson, Angela Radich, Katrina Sharman, Stephanie Abbott and Nigel Myers), October 2004, 15. 8. RSPCA Australia, The Kangaroo Code Compliance Report: A survey of the extent of compliance with the requirements of the Code of Practice for the Humane Shooting of Kangaroos, prepared for Environment Australia, July 2002 <http://www.deh.gov.au/biodiversity/trade-use/publications/kangaroo-report/summary.html#71> accessed 8 October 2010, 5.2. 9. RSPCA Australia, The Kangaroo Code Compliance Report: A survey of the extent of compliance with the requirements of the Code of Practice for the Humane Shooting of Kangaroos, prepared for Environment Australia, July 2002 <http://www.deh.gov.au/biodiversity/trade-use/publications/kangaroo-report/summary.html#71> accessed 8 October 2010, 5.2. 10. RSPCA Australia, The Kangaroo Code Compliance Report: A survey of the extent of compliance with the requirements of the Code of Practice for the Humane Shooting of Kangaroos, prepared for Environment Australia, July 2002 <http://www.deh.gov.au/biodiversity/trade-use/publications/kangaroo-report/summary.html#71> accessed 8 October 2010, 5.2. 11. NSW Young Lawyers Animal Law Committee, 'A submission to the NRMMC Working Group on the draft National Code of Practice for the Humane Shooting of Kangaroos and Wallabies' (prepared by Amber Hall, John Mancy, Eve McWilliams and Angela Radich), March 2008, 13. 12. NSW Young Lawyers Animal Law Committee, 'A submission to the NRMMC Working Group on the draft National Code of Practice for the Humane Shooting of Kangaroos and Wallabies' (prepared by Amber Hall, John Mancy, Eve McWilliams and Angela Radich), March 2008, 13. 13. The NSW Young Lawyers Animal Law Committee has proposed that 2.3 of the Code be amended to substitute ‘Shooters should avoid shooting female kangaroos where it is obvious that she has a dependant young’ with ‘Shooters must not shoot female kangaroos.’ NSW Young Lawyers Animal Law Committee, 'A submission to the NRMMC Working Group on the draft National Code of Practice for the Humane Shooting of Kangaroos and Wallabies' (prepared by Amber Hall, John Mancy, Eve McWilliams and Angela Radich), March 2008, 11. The RSPCA has argued that it 'may be that the only solution which would totally avoid the potential of cruelty to pouch young would be not to shoot females at all'. RSPCA Australia, What happens to joeys when female kangaroos are shot? 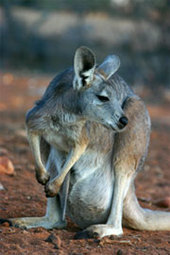 (Last updated 21 October 2009) <http://kb.rspca.org.au/What-happens-to-joeys-when-female-kangaroos-are-shot_76.html> accessed 8 November 2010.